Photograph of a pyatthat on the city wall of Mandalay in Burma, from the Archaeological Survey of India Collections: Burma Circle, 1903-07. The photograph was taken in 1903 by an unknown photographer under the direction of Taw Sein Ko, the Superintendent of the Archaeological Survey of Burma at that time. Mandalay was Burma’s last great royal capital and was founded in 1857 by Mindon Min (reigned 1853-78), Burma’s penultimate king, in fulfilment of a Buddhist prophecy that a religious centre would be built at the foot of Mandalay Hill. In 1861 the court was transferred there from the previous capital of Amarapura. The city's glory was shortlived however as in 1886 it was annexed by the British Empire after the Third Anglo-Burmese war, renamed Fort Dufferin, and a military cantonment was built inside the walls. The original city was built as a fortress in the shape of a perfect square with the Nandaw or Royal Palace at the centre. Its battlemented walls faced the cardinal directions and were each nearly two kilometres (1.2 miles) long, surrounded by a 70 metre-wide moat on all four sides. There were twelve city gates, the main gate being the central gate in the east wall which led to the Great Hall of Audience in the Royal Palace, and five bridges spanning the moat. 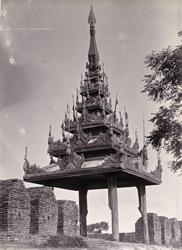 The gateways and multitude of bastions were crowned with tiered wooden spires or pavilions known as pyatthats, a characteristic symbolic feature of Burmese royal and religious architecture which demarcate sacred space. All the pyatthats had five tiers, with the exception of the pyatthats over the central gateway in each wall which had seven tiers because they were used by royalty. This view shows a pyatthat over one of the bastions, its eaves decorated with elaborate ornamental wood carving. Burma has an ancient tradition of woodcarving. The artform was used in many contexts but the most beautifully carved and intricate examples were generally found as applied decoration on palaces, monasteries, pagodas and associated structures. The walls and the moat were all that remained of the royal fortress following the complete destruction of the palace and other buildings by Allied bombing raids in 1945 during the Second World War.